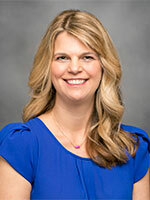 Lyndsay Ammon Avalos, PhD, MPH, is a research scientist at the Kaiser Permanente Northern California Division of Research. She holds a bachelor’s degree in animal physiology and neuroscience from UC San Diego, an MPH from Boston University, and a PhD in Epidemiology from UC Berkeley. She was an NIAAA pre-doctoral fellow through the training program at the Alcohol Research Group in Emeryville, Calif., and UC Berkeley’s School of Public Health. Her doctoral studies concentrated on the modifying effect of multinutrient supplements on the relationship between alcohol consumption during pregnancy and reproductive and perinatal outcomes. As a Building Interdisciplinary Research Careers in Women’s Health (BIRCWH) K12 scholar, Dr. Avalos’s research assessed the effectiveness of Kaiser Permanente’s Universal Perinatal Depression Screening program. Her current research broadly focuses on identifying genetic and environmental factors (e.g., alcohol use, medication exposure, ambient temperature, nutrition) during the perinatal period that influence maternal, fetal, and infant health. The aims of this study are to: 1. Estimate risks of adverse pregnancy outcomes after antihypertensive medication exposure compared to a) untreated chronic or gestational hypertension, and b) healthy pregnancies with neither hypertension nor treatment. We will study: a) Maternal outcomes including cesarean delivery, postpartum hemorrhage, pre-eclampsia, and ICU admission; and b) Neonatal outcomes including preterm birth, small-for-gestational age, intensive care unit (NICU) stay, congenital malformations, and perinatal death. 2.Examine how risks vary for different antihypertensive agents. 3.Examine how risks vary according to the degree of blood pressure control achieved during treatment. 4. Examine how risks vary by obesity, GDM status and race/ethnicity. Research is desperately needed to inform safe and effective interventions for the prevention and treatment of maternal depression. An important first step to understanding whether nutrition may serve as an intervention and improve maternal mental health, is to elucidate the relationship between nutrition and depression during the peripartum period (during pregnancy and after). The aims of this study will address a gap in knowledge and provide insights into the relationship between nutrition and maternal depression which will take us a few steps closer to identifying whether dietary modifications or supplements may provide an inexpensive, easily modifiable intervention for the prevention of peripartum depression. The overall objective of this study is to examine the impact of climate change on the risk of preterm delivery (PTD) by using a case-crossover study design utilizing members of KPNC. In our first aim, we will assess the relationship between apparent temperature and PTD. Estimates will be adjusted for important air pollutants. In our second aim we will determine whether maternal factors (age, race/ethnicity and SES as measured by medicaid status) impact the relationship between apparent temperature and preterm delivery. Finally, we will explore whether additional maternal factors may impact the the relationships in the first aim. These additional factors include hypertension, smoking, alcohol use, medication use, gestational diabetes, depression, and pre-pregnancy BMI. Birth Defects Res A Clin Mol Teratol. 2012 Jun;94(6):417-23. Epub 2012 Apr 18. Soc Sci Med. 2017 Dec 12. J Hum Lact. 2017 May;33(2):256-266. Epub 2017-03-23. Formal and informal substance use treatment utilization and alcohol abstinence over seven years: Is the relationship different for blacks and whites? Drug Alcohol Depend. 2012 Feb 1;121(1-2):73-80. Epub 2011 Sep 21. J Womens Health (Larchmt). 2015 Apr 15. Health Educ Behav. 2014 Dec 12. BMC Pregnancy Childbirth. 2014;14:379. Epub 2014-11-25. J Womens Health (Larchmt). 2014 Nov;23(11):904-11. Epub 2014-10-20. Alcohol Alcohol. 2012 Nov-Dec;47(6):640-8. Epub 2012 Aug 22.